It started when I texted The Apostles to say that G-Money and I were coming to visit. When Simon (who is called Peter) realized that the date of the trip fortuitously coincided with the Senators playing the Leafs in Toronto, he reserved us a table at Real Sports in Maple Leaf Square. The text came in: "There you go, boys. We have a table at the most popular sports bar in Toronto," and it was decided. Despite the faint aura of Doom that had suddenly settled over the trip, the opportunity was too good to pass up, and G-Money and I piled into the car, punched "Bat Out of Hell" into the stereo, and turned up the volume as we hit the 401 on-ramp. You know, to set the mood. The further west you travel down the north shore of Lake Ontario, the more the Toronto Maple Leafs permeate the fabric of your existence. If one tried to determine the source of this insidious #SeaOfBlue, you could do no better than to conclude that Real Sports is Ground Zero. The spirit of Leafs Nation emanates from its origin and circles the globe, detectable from anywhere on the planet, as if the bar is some sort of sports Fukushima. Like the ill-fated nuclear facility, efforts to contain the contamination failed long ago. Peter, Andrew, G-Money and myself embarked on our quest roughly a half-hour before the game started. The journey to Real Sports is not unlike the journey to the Air Canada Centre. You take the same subway, get off at the same stop, and follow the same crowd through the same doors before taking a right turn a few meters away from where you're asked for a ticket. This means that you absorb some of the pre-game excitement through osmosis. After you cross Maple Leaf Square and arrive at Real Sports, you really feel as if you're there for An Experience, which is all part of the fun of live sports anyway. The fact that our party of four got in at the appointed time surprised me. The restaurant was already bursting at the seams (and likely had been for hours beforehand) and the line to get in was so long that they could have quite easily ignored any reservations without fear of ever losing money. If they did this, I'm sure that it would have a negative effect on the bar's reputation, but the people who go to Real Sports are not there because they are interested in reputation. I knew why they were there as soon as I entered; it was impossible to miss it. The main floor of the bar is completely dominated by an enormous screen. I'm not sure how large it is, but you could make up any astronomical number you liked and I'd believe it. Jumbotron is an inadequate description. I prefer to call it the Gargantotron. Or Gigantotron. Or Enormotron. Like a streaker at a public beach, it's impossible to not look at it. There are many other normal sized televisions strewn throughout the lower level, but they're pointless because no one's watching them unless they're an NBA fan, which means no one's watching them. 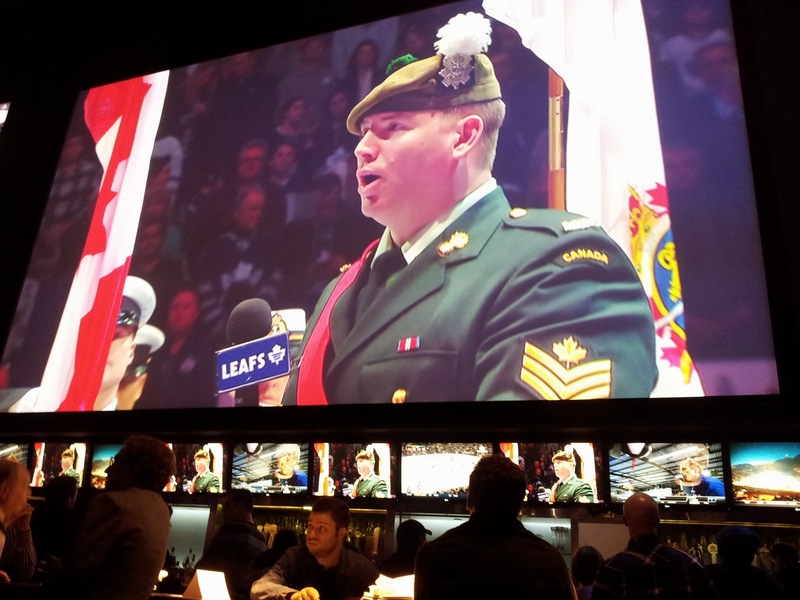 A very large serviceman sings O Canada. Other TVs are included in the picture for scale. Our service was excellent given the number of people in the restaurant. Our server was happy to engage in good-natured banter, and gave me an excellent food recommendation, and suggested that I order "the largest beer", something in which I was more than happy to oblige her. Late in the first period, a miracle occurred: Chris Neil scored. I celebrated in the only manner that one can following a Chris Neil goal, which is to say obnoxiously and with enthusiasm. The other patrons regarded the events with an indifference that bordered on apathy. This, in my experience, is the defense mechanism of Toronto sports fans. They don't become sad or angry so much as pretend they never cared in the first place. Never has this tendency been more obvious than That Game Seven when Leafs fans went from preparing for a Round 2 matchup to total emotional devastation to insisting that the season was still a success because they never expected anything good to happen anyway, all in the span of about 7 minutes. Just watching it gave me whiplash. Seasoned observers will notice a similar thing that occurs with the Blue Jays over the period of April, May, and June every year. As the first period ended, rather than being forced to see Don Cherry's latest suit on the 100-foot screen, I wisely ducked out to the washroom. This veteran move was not without disadvantages as I was almost immediately confronted by two Leafs fans. It was clear I was not going to get out of this situation without interacting with them in some way, and they seemed to relish the opportunity to force me to engage in a sort of battle of wits. Leafs Bro #1 led with his strongest opener. "Man, I wish we had Chris Neil instead of Mason Raymond." "Um...but isn't Mason Raymond good at hockey?" "Yeah, but Chris Neil fights!" It's a rare thing for me to be speechless, but there I was in the bathroom of Real Sports rendered mute by a stranger in a Joffrey Lupul jersey. Leafs Bro #2, having noticed a lull in the action, then launched into a comparison of the relative merits of Colton Orr vs. Chris Neil, concluding that they were likely of the same quality. Looking back in sober hindsight, it's possible that I misjudged the intentions of these two men. Many a legendary friendship has been forged in the Crucible of the Men's Room, and perhaps they were simply trying to put me at ease. The problem they likely ran into, however, is that neither of them had ever actually met a Senators fan before and didn't know what polite things could possibly be said to one. I guess I appreciate the effort. I will not say that they didn't try. In your mind, replace the tennis racquet with a beer. I thought Spanish body language would be a universal language, but Real Sports remained uninvested and emotionally distant, like your girlfriend after she realizes the relationship isn't going to work out. This didn't last. When The Phil (to use his religious name) scored to cut Ottawa's lead to one goal, Real Sports exploded like a politically correct simile. Three spotlights in the shape of the Maple Leafs logo suddenly activated and whirled around on the screen. The bar platform started rotating in the air far above our heads. It was like being at the worst Rush concert ever. I merely smirked in my chair while assuming a confident air of nonchalance, as if it was the plan all along to let Toronto score. I've had lots of practice with this. It's very important to never let Them win, no matter how badly You are losing. My air of nonchalance was shattered minutes later when Nazem Kadri boarded Cody Ceci in a play that should be featured as an example of a hockey foul from now until the end of time. While I was enraged, the pro-Leafs crowd was ebullient and filled with blood-lust. Somewhere, another Sens fan tried to engage in rational protest, and was quickly pelted with beer cans (not all of them were empty) by the frenzied crowd. I tried to avoid eye-contact with anyone, but some trendy looking college student dressed in designer clothes noticed my weakness and picked me out. From that point forward, the night took on a sort of perverse quality. I was trapped in Hell. My sanity only barely hanging by a volatile combination of beer, respect for social convention, and a rapidly fading sense of hope, The Gods frowned upon me and sought to strike me down as An Example to Others. As the expression goes, those who the Gods wish to destroy, they first make drunk, and so it was with me. Our waitress appeared at the table with eight tall cans of a beer which I shall not name (but it sounds like "Boors Fight"). No one had ordered these; they were comped to us. I was hazy on the details, but it's not my habit to look a gift beer in its wide, easy-pour mouth. Receiving free beer at a bar sounds crazy, but I assure you it happened. 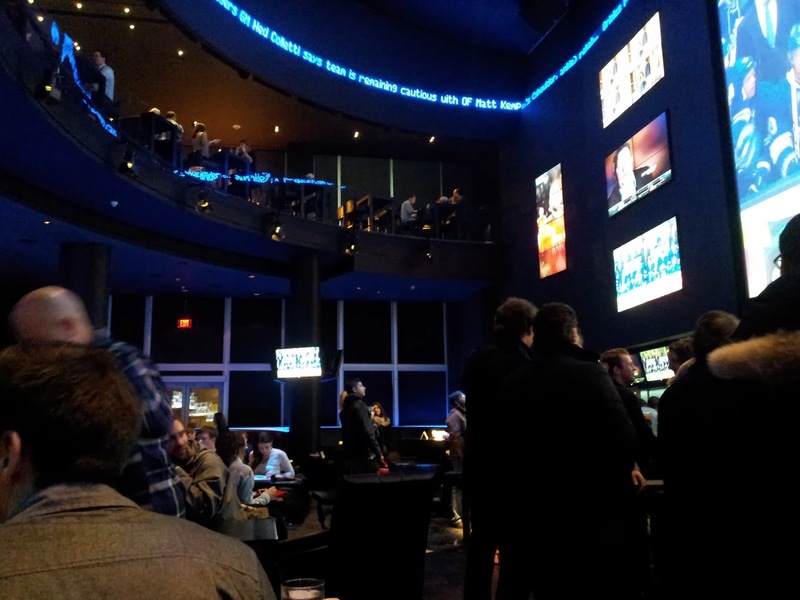 The rules and social conventions mean nothing at Real Sports. Having ensured that I was to be sufficiently unstable, Phil Kessel went in for the killing blow. After his second goal of the game, I struggled to maintain my legendary equanimity. American Eagle, noting my displeasure, obnoxiously wandered over and stuck his hand in my face, ostensibly for a high-five, but more likely to increase my misery because he was the sort of person who is only capable of being happy when others are sad. Typical. On the Enormotron, somehow Ottawa was still in the game. Against my better judgment I began to consider entertaining the idea of a positive outcome to the evening. I did this because I am a credulous fool. The full depth of my ignorance became obvious to me once Phil Kessel completed his hat trick and gave the Leafs the lead for good. Tommy Hilfiger, apparently not concerned about having too much of a good thing, came over to agitate me again. By this point even G-Money and The Apostles were becoming clearly annoyed. G-Money and Andrew are Leafs fans (Peter is a Canucks fan) yet Hugo Boss had turned his own kind against him. G-Money let there be no bones about the matter, telling me, "Yo, if you wanna punch that guy, we'll stop his buddies from taking you off." G-Money and I have never been in a fight before, but Real Sports is the sort of place that caters to people's baser instincts. I contented myself with trying to work out how to check Leafs fans from behind into the bar while making it look like I tripped. For his part, Peter had begun to take free beers from the surrounding tables if they'd been unattended for long enough. Society was collapsing all around me. Full anarchy broke out when Tyler Bozak scored with less than two minutes remaining. For myself, the potent combination of booze and rage had reached a tipping point. My first instinct was to start flipping tables, but that seemed unoriginal. My second instinct was to fight everyone at once, but that seemed unproductive. Finally, I decided that the only course of action was to become a multi-billionaire, buy the Maple Leafs, and then fold the team. These thoughts occurred to me in the span of about 0.78 seconds. One thing was certain: I was never going to become a multi-billionaire unless I got out of this hateful sports bar. Fans all around me began looting the bar. They picked up tables and ran them into the kitchen. Someone on the top level began to shower the lower levels with beer. I tried to pull a fire alarm, but nothing happened. As the riot police began to organize outside, I grabbed my wallet threw most of my twenties down on the table and left without saying a word to anyone. I'm sure my waitress will never forget the angry Sens fan who tipped 300% of his total bill. I only wish I could forget. Naturally, I was forced to push my way past Calvin Klein as I left. As I walked out of the doors, the horn following Nazem Kadri's empty net goal lingered in my ears. I didn't look back.